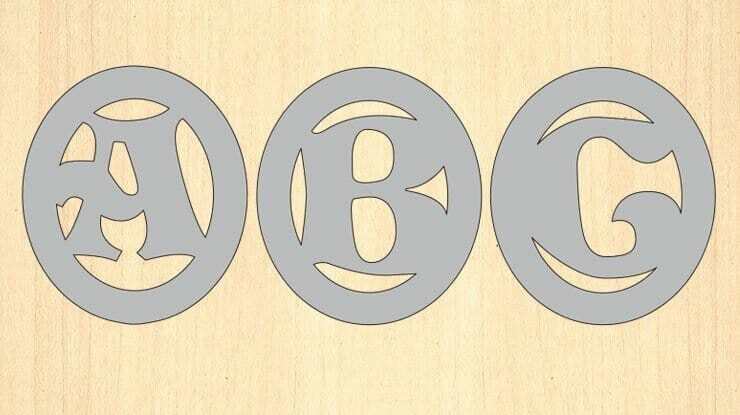 35 free scroll saw patterns, all available here so that you don’t have to break the bank. Many woodworking enthusiasts should already know the wonders of a scroll saw. But the rest of you may be asking– what is a scroll saw? Scroll Saws are handy tools for creating all sorts of decorations from various types of wood. 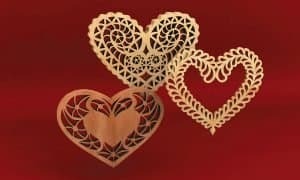 The invention of the scroll saw has made the art of scrollwork and scroll crafts easier than ever. You can now gain fine control and great precision with your angled cuts when working on your wood crafts. 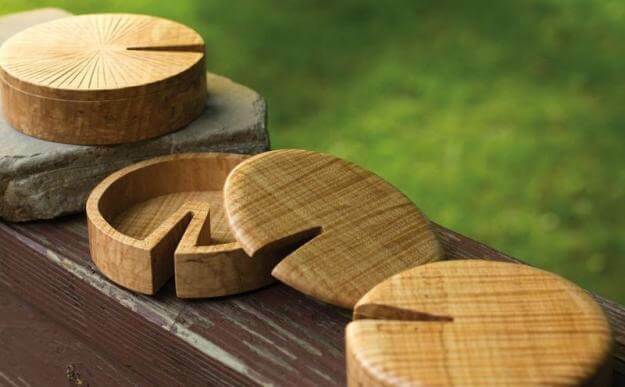 So even if you’ve never dabbled in scroll saw crafts, why not give it a shot? 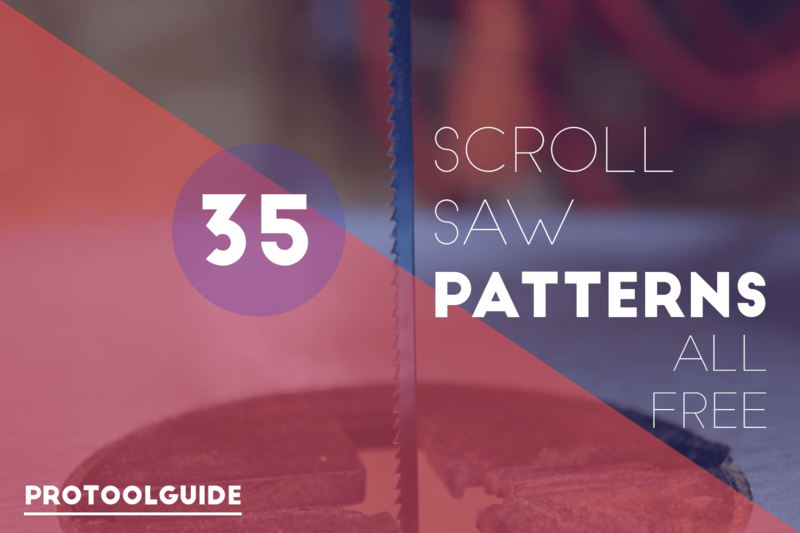 From beginner’s cuts, to cuts of intermediate difficulty, to elaborate cuts for experts, we’ve got the whole range of free scroll saw patterns, right here for you. In no time, you’ll be churning out intricate works of beauty. Here’s a whole range of printouts and guided patterns. These will aid you greatly with creating your woodwork crafts— definitely more so than eyeballing those projects. And each of these patterns will cost you exactly zero dollars and zero cents. Who doesn’t like a good puzzle? These are great for giving your kids a few minutes of fun. They also serve as cutesy display within your home, in a playpen, and so on. 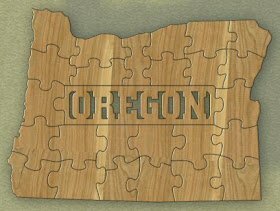 This puzzle pattern of the state of Oregon will fit right at home with all you Oregonians out there. Display this right next to a state flag in your home, place it among your child’s toys, or even use it decor for a state fair booth. Paint it in blue and yellow, just like an state flag, for an extra pop of color. Try out this fitting ultramarine chalk paint by Renaissance Paints. Arpop also provides a whole array of free puzzle patterns for other states, such as Arkansas and Oklahoma, so don’t feel left out! The small, adorable Volkswagen Beetle is one of the most iconic car models ever made. 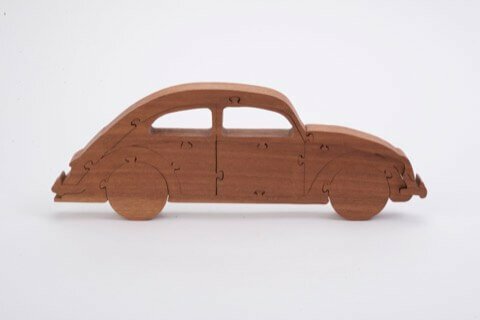 This scroll saw craft is based off the second-generation Beetles built between 1957 and 1967, lending this small piece a subtle air of hipster chic. This craft is freestanding, making display of it extra easy. The puzzle pattern of this piece makes it pleasantly quirky too. Display it on your mantel, or even mount it on a wall. This craft is a compact and cute Noah’s Ark. It’s great to bring to parties and events in the festive season, but you can also use it as all-year decor. To save on costs, get dabs across many colors by purchasing an inexpensive set of acrylic paint pots. Just make sure to seal and prime your wood if you use acrylic. You kids will have a splash fitting in and taking out the tiny multi-colored animal puzzle pieces. The link below provides plans for the ‘ark’ itself, and for the animal pieces too. There’s no reason not to spruce up your place of prayer. 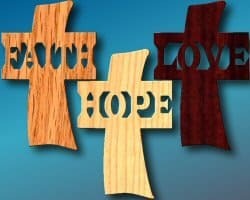 These scroll saw cross patterns provide you a thrifty way to make the religious pieces in your home more personalized, and more ornate. This cross craft comes with a beautiful running scroll pattern around its border. Highlight its place in your room, by staining the thick borders a much darker shade, or by using a different type of wood. Consider replacing the English label with the christogram “IHS” for a vintage touch. 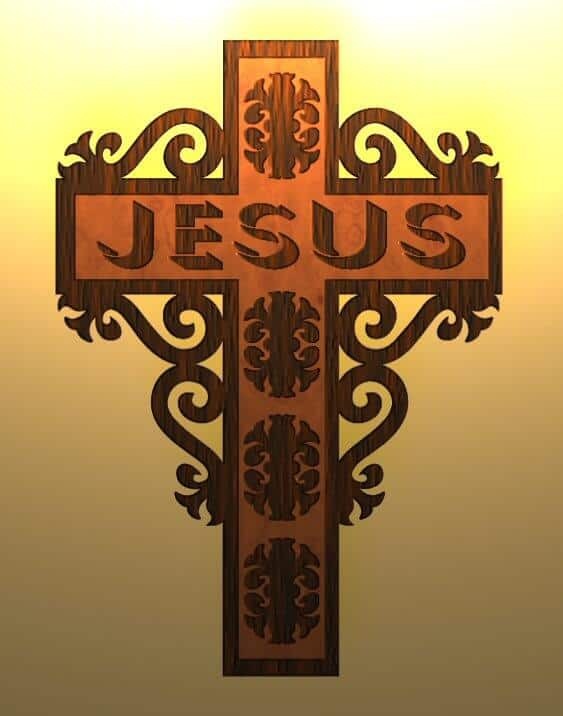 Prop it up above a fireplace, or mount it below a religious portrait. I recommend leaving it unpainted (although umber stains are good) for a touch of solemnity. 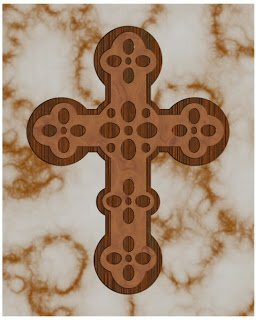 The simple but consistent patterns on this cross make it rather unique, and somewhat easier for scroll saw beginners too. Because of its relatively more minimalist aesthetic, consider making miniature versions of it to be worn as necklaces or attached to gifts. Contrasting dual shades of brown also contributes to the decor of this craft, so consider picking up a pot of wood stain. The craft is made from two layers of wood cutouts, giving an extra dimension that improves its beauty. 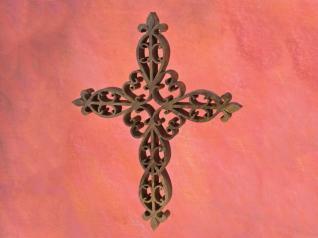 This beautifully intricate cross lends quite a touch of the vintage and the elaborate. The gothic scrollwork pattern recalls the old times, but is perfect too for a home in this century. Small versions of this would make for beautiful decor this Christmas, but also consider making these a permanent fixture. While the tight and precise angled cuts of this may seem difficult, you’ll get there with practice. Here’s a somewhat less solemn and more cheerful-looking take on the Christian cross. Relevant labels are cut out, in a peppy font, across gaps in these crosses. Consider varying the shades of woods and stains you use, to make each of these crafts unique. Display them against a complementing background of light blue, for a more fun-looking twist to your religious pieces. This wooden basket comes with a beautiful ‘weave’ pattern to give it that hint of tropical chic. 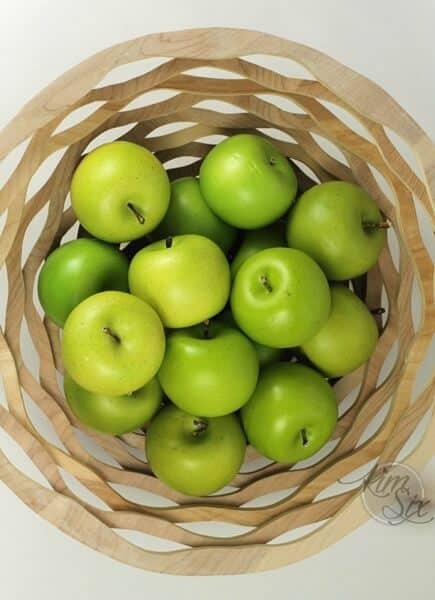 Place some apples, pears and various fruits into it, and it’d make for a great centerpiece for a summertime tablescape. This project may look intricate, but the angles of the cuts make it pretty forgiving, and fit for beginners. The craft is made from layers of wavy rings staggered and stacked together, but you could use just one piece of wood. 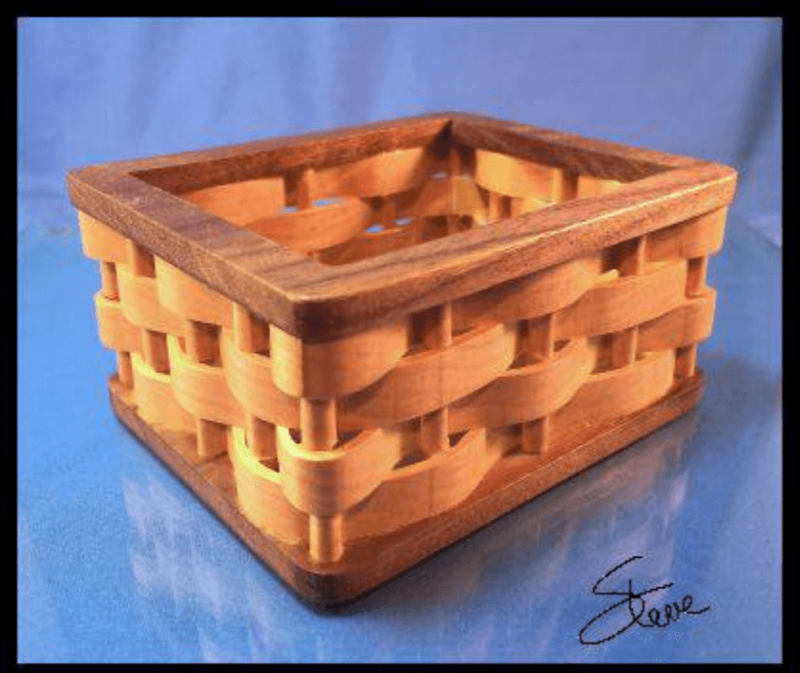 The classic picnic basket can be made from wood, and from using a scroll saw too. I find that using wood makes my baskets much hardier and sturdier. If you do use these baskets to store food, I recommend sealing it with a food-safe finish, such as carnauba wax, which you can get from below. All three scroll saw patterns are available below. Take note that you should adjust the size of the handle cutout provided, so that it matches the thickness of the wood you use. 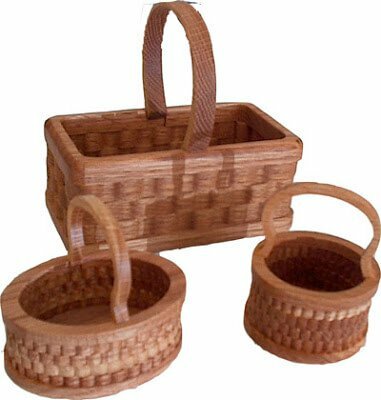 This basket has an interesting picnic weave pattern that really pops, thanks to the variance in which the weaves protrude out, and how those weaves wind around the little poles of the basket. Make your basket stand out further by using contrasting shades or stains of wood, to highlight the top and bottom borders of the basket. Make a small version to display your toys and ornaments in. For a quirky touch, try mounting it to your wall. Baubles, a star, and plastic trinkets– these are all the usual decorations you may use to ornament your Christmas Tree. But why not change that up a little this festive season, by adding your own woodwork ornaments? 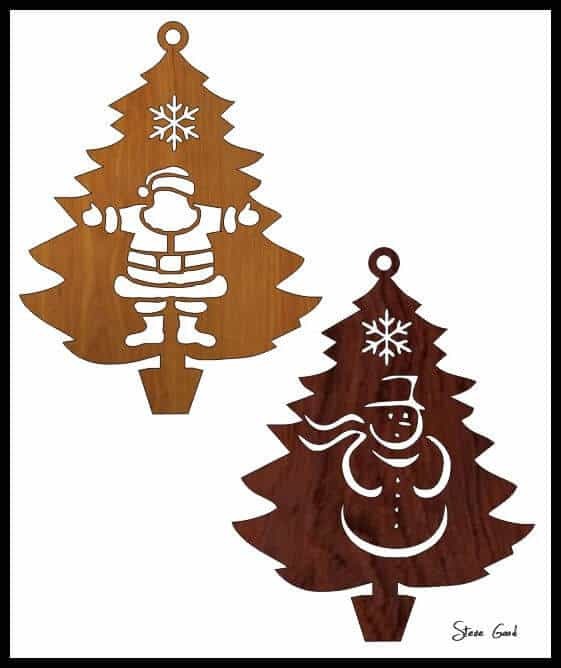 These wooden cutouts are sure to balance out the bright colors on and of your Christmas Tree. Here’s an interesting idea– why not decorate your Christmas Tree with some littler trees? These four mini projects come with silhouettes of various festive objects carved out of the shapes of Christmas Trees. The plans come with ‘punched-out’ holes attached to the top of each tree shape, allowing you to easily hang it off your large Christmas Tree, off clothes hooks, or even tied by string to a Christmas gift. Here’s another beautiful bunch of ornamental crafts to spruce up your home with, this festive season. 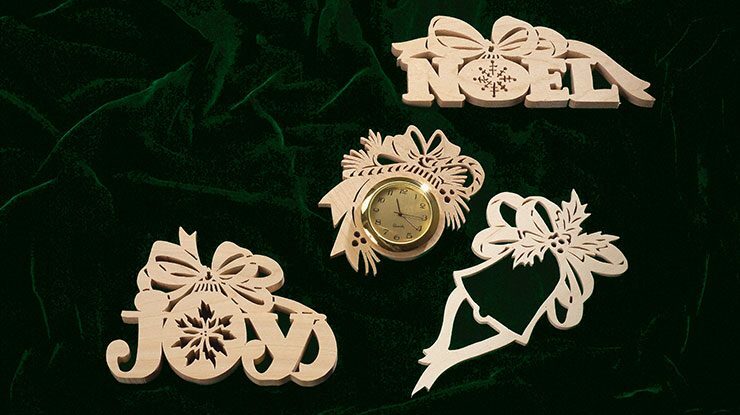 All four of these woodwork decorations come with the shapes of ribbon bows, making them a perfect fit for attaching to all sorts of Christmas gifts. Expand on these elegant designs by including miniature clocks in the middle of these crafts. You may also attach them to picture frames, or just display them on your mantle. 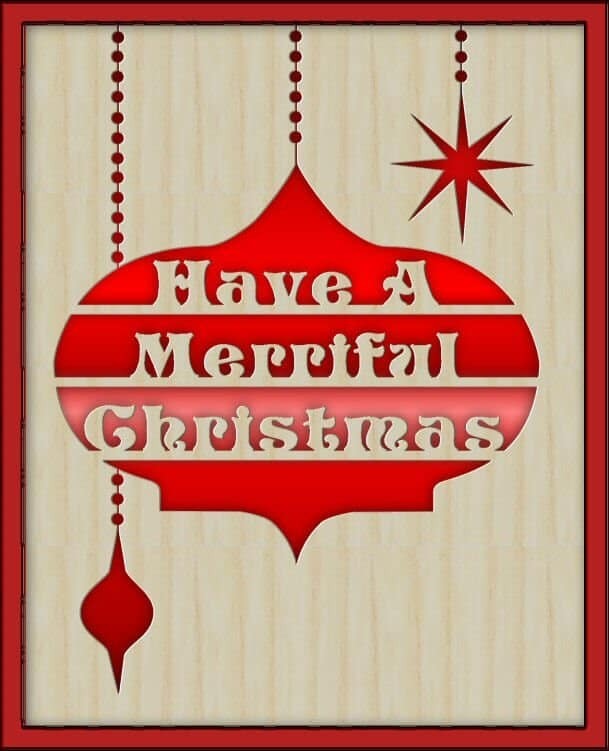 This silhouette of a Christmas bauble, with a cutout of Christmas greeting, makes for a great craft to place over colored paper, in a picture frame. You also reverse the cutouts to yield an ornament for your Christmas tree. Pick up some poplar boards for this craft– it’s a solid but beginner-friendly wood to do scrolling with. Place these pieces of DIY art around your home this Christmas, by tea lights and tablescapes. 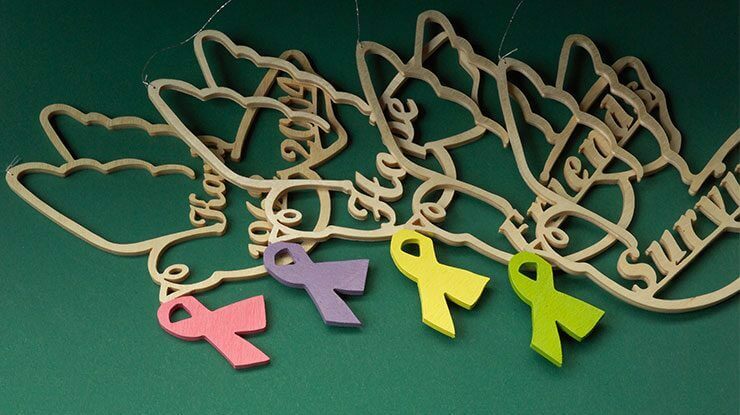 These dove crafts serve not only as fitting Christmas ornaments, but more solemn tributes to the causes of charities promoting cancer awareness and support. As the dove is symbolic of peace, you may also leave out the colored ribbons, to yield ornaments that support pacifism. Feel free to personalize the labels on the doves– you can do personal names, words such as “Peace” or “Hope”, or carve out important years/dates in your life or the life of a loved one. These minimalist monograms, done up in curvy font and placed within the borders of ovals, are a great addition to various crafts. Place them on the walls of a kid’s bedroom to spell out their name, make them into magnets for the fridge, or even attach them to the covers of books you most love. You could try staining the oval borders to get a contrast from the alphabets, as this would make your monograms stand out. Since scroll saw name patterns are highly personalized, this can make it hard to find a suitable guide and printout. However, this guide over at justbuildstuff, gives you a full video, step-by-step instructions in text form, and even helpful screencaps as the written guide goes along. Although you’ll still have to make your own pattern, the detailed tips make that much easier. 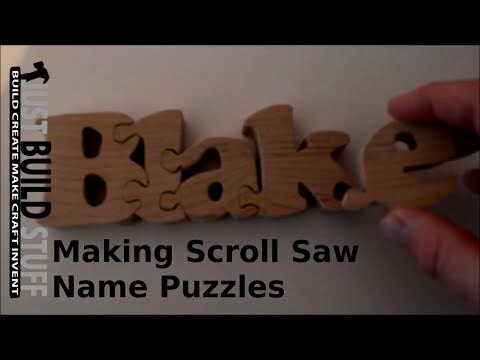 This scroll saw saw craft comes in a fun puzzle pattern, so you can even take your pattern apart to make other names and labels. Name keychains are a staple of kids’ backpacks and for good reason– it’s an easy way to personalize their bags, and may even help with identification if the bag is misplaced. DIY some keychains for your kids, with just wood, a scroll saw, a keychain ring, and a keychain link. The guide below comes with a step-by-step video tutorial, and recommends that you try out the Scroll Saw Keychain Maker program. The cheery 3D cutouts of this scroll saw name plaque, paired with bright and peppy paint, really makes it come to life. 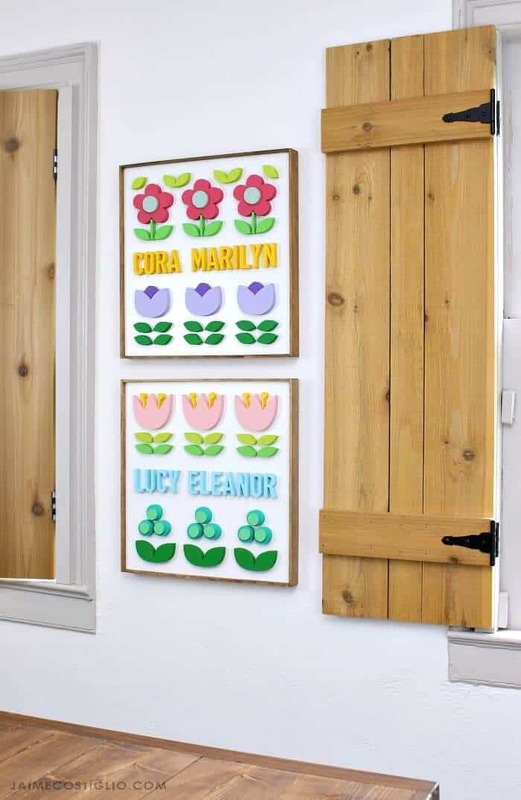 Surround it with some cartoon-style cutouts of flowers and leaves, for the perfect addition to any playroom or kid’s bedroom. For that eye-catching pop-up effect, we recommend that you use thick materials for this, but you could choose to glue together layers of thinner material instead. 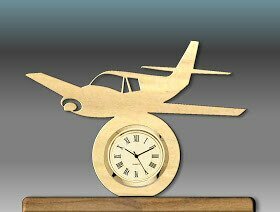 Border a miniature clock with a cutout of an airplane, to make it a great fit for any aviation enthusiast. It makes for a good personalized gift, or a neat addition to a nightstand or wall in your bedroom. Pick up a classy, elegant miniature clock insert, which comes with roman numerals and a thin golden border, from the link below. You may also draw inspiration from this craft idea to try scrolling out the exact model of airplane you love. 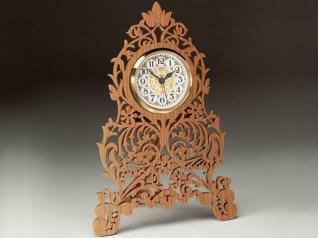 This vintage-looking dutch windmill woodwork craft, comes with a miniature clock at its heart. While it comes in a deep mahogany color in the example, you could try cheering it up by painting the ‘blades’ white, and the body of clock baby blue. Surround it with some porcelain or ceramic dolls, and various rustic trinkets, for a rustic, European feel to your home. Also check out the castle craft that’s also attached to the plans below. Clocks, in marking the passage of time, may seem to always be hurrying us up. This woodwork project, while it also involves a miniature clock, tells you instead to slow down, do things well and steadily, and so forth. The craft succinctly reads “Haste Makes Waste”. Fittingly, it comes with a cute snail cutout slithering over the slogan. This may in fact be a good addition to a classroom. Sure, you want students to submit work on time, but you wouldn’t want it to be rushed and sloppy. 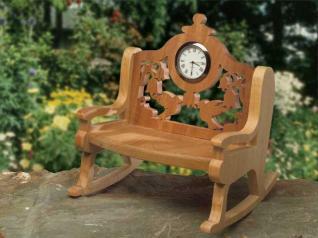 This tiny, whimsical-looking clock craft is an amusing addition to any table or windowsill near or in a garden. With its small size, ornate scroll pattern on the backrest, and clock housed within a thick border in the top middle, it really gives off that fairy-like springtime feel. The guide below comes with detailed instructions, including exactly what sizes of blades and types of bits you need, so fret not about tackling this seemingly more difficult project. This stunningly intricate fretwork clock is freestanding, and is sure to lend a regal atmosphere to wherever you place it. Despite that, it’s actually relatively easily to stack cut. Just make sure to fit the design of your clock to this aesthetic too. Pick up some sandpaper to smooth your pieces of wood with, and for smoothing between finishes and sealants too. This standing clock is a great gift for any occasion, and elegant decor for any of your shelves. This abstract-looking artistic scroll saw craft has a modernist aesthetic that’s sure to wow. It may remind you of leaves, or a part of a flower, or even the Chrysler building. It’s all up for interpretation. This craft is made from cutting, layering, and gluing together seven fretwork designs. Note how the careful layering creates meticulously placed shadows in the artwork. Place this on your coffee table, or even mount it on a wall. It makes for a tasteful piece of DIY art. The design for this amazingly intricate scrolled box, is allegedly taken from a Russian book dating back to over 100 years ago. With the pattern’s stunning attention to detail, it’s easy to see how this design has not been lost to history. 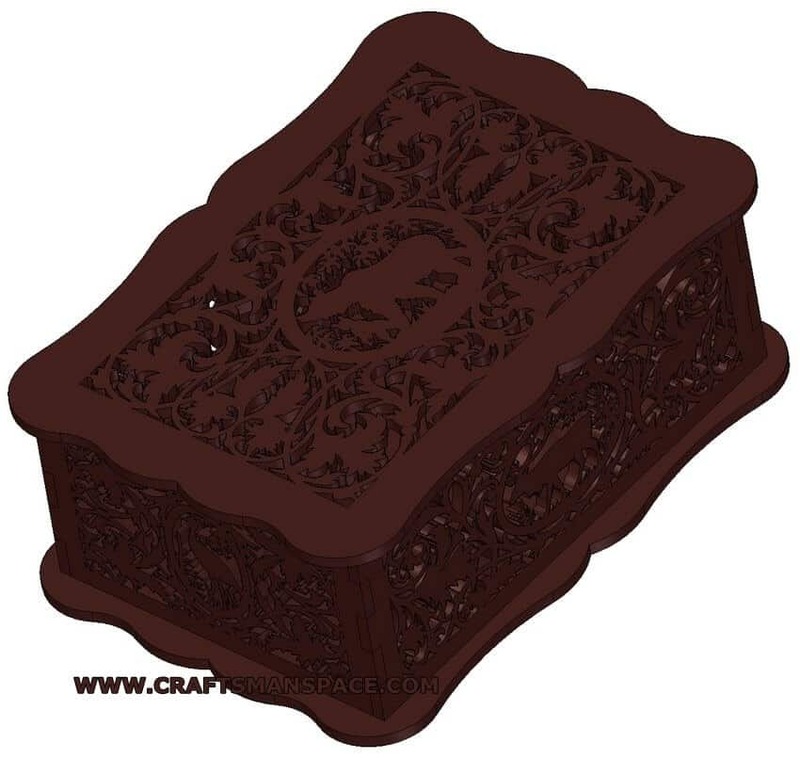 Its scrollwork is filled with various leaf patterns and animal motifs, giving the box a theme of nature that’s a great fit for gardens. To build on the vintage feel of this craft, use a wood or wood stain in a deep, rich mahogany shade. 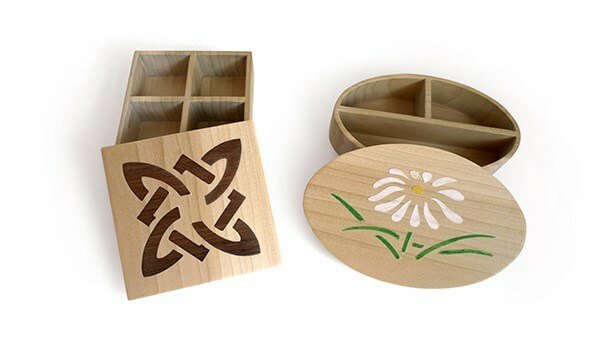 These inlaid scroll saw patterns provide you with simple but pretty designs for your boxes. 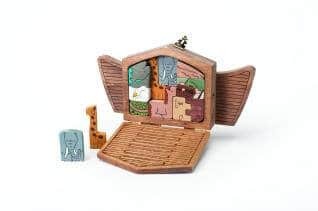 There are instructions for crafting the box itself as well– the compartments that split up the box certainly come in handy for storing and organizing smaller items. The patterns for the box lids consist of two layers– a base layer, and a top layer with a cut out. Simply scroll out the cutouts, and then paint into the cutouts, to yield the designs. These lily-pad-inspired boxes are a simple yet creative way to spruce up your garden. Use these to store excess potting soil, or just use them as decoration. If you want to match these crafts to the actual color of lily pads, pick up some green enamel paint for the lids of the boxes. Leave these boxes by a ledge overlooking your backyard, or between your flower pots, or perhaps inside your treehouse. This fretwork pattern comes with a pegasus displayed mid-gallop inside a circular border, centered within an intricate fretwork panel. This craft is therefore perfect for fantasy-lovers out there. The design is mystical and almost medieval, but also feminine and fancy. 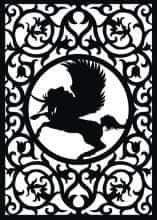 Use it as wall art, or even do a thin-layer version of it to attach to the cover of your favorite fantasy novel. It’s also a great gift for many young girls. You may choose to omit the wings to yield a unicorn design instead. This beautiful book rest consists of sturdy shelves and ornate fretwork panels. It’s sure to lend a classy, vintage feel to your home. As the detailed sheets with the patterns are meant to be printed on large paper, we recommend that you take it to the printing shop. Instead of scrolling out the monogram in the top portion of the design, you may choose instead to cut out that circular portion and insert a miniature clock. This will give the craft a quirky yet still fancy vibe. These Battenberg-lace-inspired fretwork hearts make for great gifts or a variety of occasions, such as Valentine’s Day or Mother’s Day. They are also suitable as centerpieces of greeting cards or as home decor. You can modify them into suncatchers too. The link below provides three different designs, from a heart that’s classically tasteful, to one with cheerily hipster vibes, to one that’s elaborate and with a touch of the mathematical. 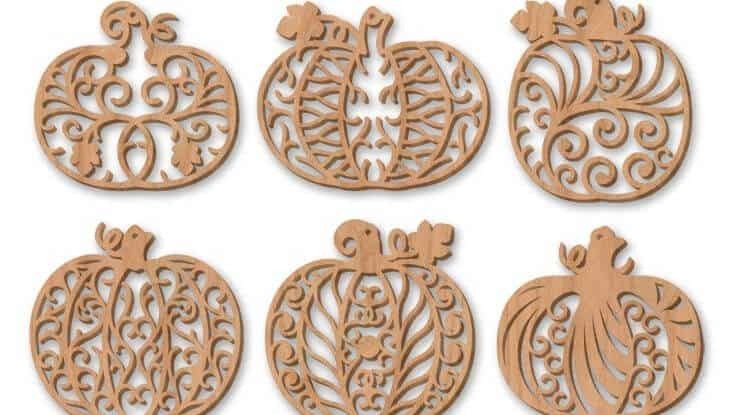 These filigree pumpkin crafts make for wonderful decor items for Halloween or Thanksgiving. While it takes some skill to make them ornament-size, you can make the project easier by enlarging the designs, and using the crafts as wall art or window art. If you make them miniature-sized, consider scattering them amongst your Thanksgiving tablescape. For Thanksgiving tablescape ideas, click below. Paint the fretwork ornaments black for a vintage, gothic feel for Halloween. Or leave them unpainted for a dab of neutral colors to balance out the warm shades of Thanksgiving. 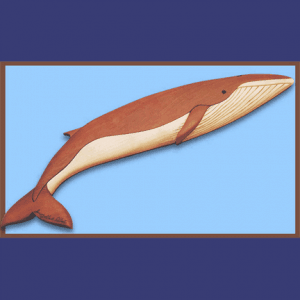 This scrollsaw pattern is highly beginner-friendly, and yields you a neat dual-shade whale that’s right at home with a marine theme. The dark chocolate shade contrasts well with white wood, and both complement cool coastal shades you may place into the backdrop. The guide below goes into great detail as to which tools you should use and how you should scroll out the pattern, further enhancing the beginner-friendliness of this cheery craft. 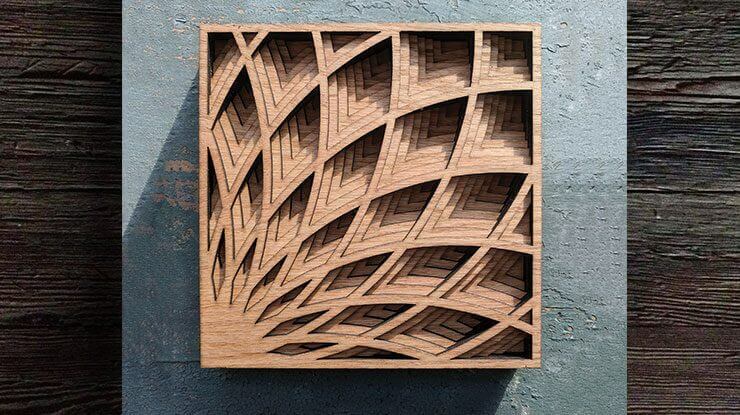 Scroll saw art isn’t just fit for walls and as gifts. This craft involves attaching magnets to the woodwork, to yield you beautiful butterfly magnets for your refrigerator. Get yourself some durably strong neodymium magnets so that your crafts will hold on well over time. 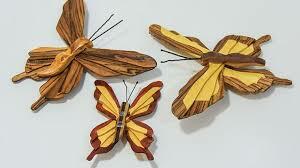 For colorful butterflies that catch the eye, use a variety of wood shades or wood types. For experienced scrollers, these small magnets are a great way to use up various shades of scrap wood leftover from previous projects. 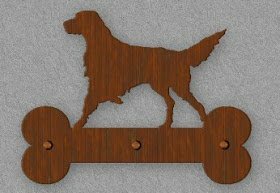 These dog-patterned holders are great for holding up a variety of items, including dog leashes. Scroll out the pattern you desire, then attach pegs or hooks to the bone portion of the design. These make for great gifts for dog lovers. You can also choose not to attach pegs or hooks, and use it as simple decor. Worry not about customizing the pattern to your favorite breed– the link contains patterns for 15 different dog breeds. This panel of a hummingbird and a flower, makes for an elegant addition to a whole variety of objects. Attach it to the inside of a rectangular box or to its lid, or paint this craft up into a tasteful art piece. A printout is provided below, but you’ll need to know which exact tools to use, and how precisely to scroll this. We recommend beginners to start with patterns with more detailed guides, to better familiarize themselves, before attempting this pattern. 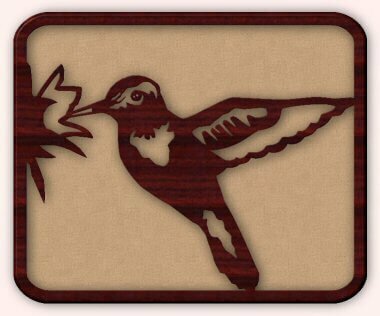 We’ve covered a fair share of beautiful scroll saw patterns, all for absolutely no cost. We hope that you’ve found just what you need to pretty up your home. Have fun scroll-sawing, but be sure to stay safe when you do so! If you have any questions or suggestions, feel free to drop a comment below, and we’ll get back to you asap.